Stop Paying $15 Per Site For Wayback Machine Rebuilds! Archive.org rebuilt sites are great for SEO but paying up to $15 for every single site that you get rebuilt isn't cost effective. With Wayback Rebuilder, you can completely rebuild HUNDREDS or even THOUSANDS of sites from Archive.org's Wayback Machine every month for a very low monthly price! And every rebuild can go up to 500 pages deep as a maximum. If you want your PBN-type sites to last, you do NOT want to convert your high quality expired domains to multi-topic WordPress blogs. that's how serious SEOs use expired domains for PBN-type sites in 2016. Ever wanted to see what a website used to look like in the past? Check out what the internet was like in the late 1990s? The Wayback Machine lets you do that - and then some. In fact, this vast web database contains over 100 terabytes of information and more than 10 billion web pages. It's a lot less complicated than you think: In a similar way to conventional search engines like Google, the Wayback Machine crawls the web and stores a cached version of a webpage in its archive. This is good news for researchers and students who can't find what they are looking for with a traditional web search. Here's everything you wanted to know about how the Archive.org works. 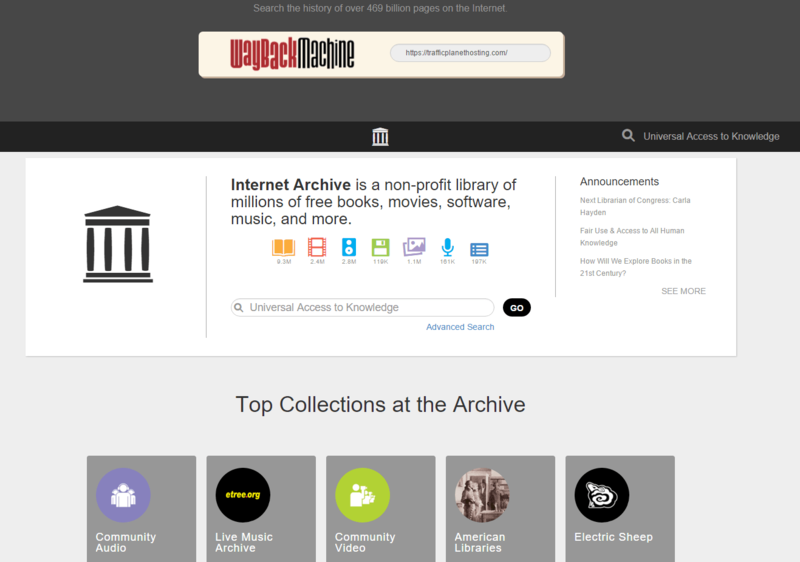 Archive.org, or the Wayback Machine, is a massive digital archive of the world wide web and other data sources (including publications, books and news reports) developed by a San Francisco-based nonprofit organization called the Internet Archive. The service, which was launched in 2001, is the brainchild of Bruce Gilliat and Brewster Kahl and has become one of the most popular and valuable resources available today, providing people with access to a deeper internet search than conventional search engines like Bing or Yahoo. Individuals and businesses can find information that is no longer visible on a traditional search engine results page, including information that has expired or been deleted from the web. Alexa Internet maintains the content on Internet Archive and the service lets users see information from 1996 to the present day, as well as archive videos, audio recordings, journals, publications and even news reports. Wayback Machine from Archive.org is frequently used by researchers, marketers, businesses and students. Here's the science behind it. Since 1996, Archive.org been archiving pages on a big group of Linux nodes. The service revisits pages on a regular basis and will archive a version of the page if content has changed. To capture web pages so they can be preserved forever on an internationally accessible database, providing a valuable resource for school and college reports, research, presentations and much more. The digital archive a huge mission: To capture the entire internet. However, as you will read later, this comes with a number of privacy issues and concerns. Ever wondered what Wayback Machine actually refers to? Well, it references the WABAC portal (which is pronounced "way back machine") in the animated television show the Rocky and Bullwinkle Show. The service has a user-friendly interface, where people can directly enter a URL and be presented with a list of digital archived pages that they can explore. Depending on when the Internet Archive captured these pages, users might be able to see older versions of a website that span back to the mid-1990s, providing a visual snapshot of internet history. The Wayback Machine story is an interesting one. Brewster and Bruce decided to create software that could crawl internet pages, in a similar way to search engines, as well a content from Usenet forums, downloadable software and the Gopher hierarchy. First, they came across some hurdles. Not all of the internet is able to be archived, especially when pages are stored in private databases. However, the service's crawlers were able to store a great deal of information and develop archives that feature information from a web page at a particular point in time. Today, students are able to see CNN's and the BBC's front pages on the morning of September 11, 2001, or check out the earliest versions of Google, long before it became the world's most visited website. In the early days of the Archive.org Wayback Machine, information was kept on a digital tape for a period of five years. The process of internet archiving is a long and complicated one. In fact, it can take up to 2 years for a page to be archived in the system, although the process is usually around six months. Archive.org doesn't provide a comprehensive overview of the entire internet either. There are plenty of pages missing, especially as you go further back; users might find links that are incorporated onto a web page have long expired, information is incomplete or graphics and images no longer show. However, the Internet Archive still serves an important function as research material and can provide a fascinating insight into contemporary history. Users can discover how the internet has evolved in recent years. Long before flashy graphics and Web 2.0, the internet was an entirely different beast, with simple, graphic-free pages that might look primitive to some today. The Internet Archive stores a lot of data. In 2009, it was estimated that data was increasing at a rate of 100 terabytes per month, up from 12 terabytes per month in 2003. In fact, Archive.org is capturing more information than ever before as the web expands. The service is different to a conventional search engine; users are unable to search for keywords and phrases like they would in Google or Bing. Instead, the user will need to know the direct URL and enter this into the search box on Archive.org to see a visual graph of versions of the page that have been indexed over the years. Users might get a 404 error if a page doesn't exist or was never indexed. It can, therefore, be difficult to find particular information, unless you have access to a URL. For example, it might be hard to find a page that you visited several years ago if you were unable to remember the web address. As the internet has evolved over the years, so has Archive.org. In 2009, the service moved its storage to Sun Open Storage and opened a brand new data hub in California. Then, in 2011, there was a new version of the service with a fresh new look and interface. This is when the Internet Archive began to incorporate other databases, including news report archives and indexed publications, strengthening its position as the go-to research tool for many students. Unlike the Wayback Machine portion of the platform, users can search keywords and find videos or news reports that match their query. A new feature, introduced in 2013, allowed users to archive a URL themselves. The platform is currently one of the most visited websites in the world, according to data from Alexa. Today, the platform hires more than 175 staff and is completely ad-free. No commercials run on the site and donations help to pay for infrastructure. Although many see the Internet Archive and Wayback Machine as a powerful educational resource, the service has had to overcome many challenges over the years. Some people have objected against the company storing data and many have tried to remove archived content in the courts. The user-friendliness of Archive.org has made it a popular platform for many users. It works like this: Users can visit the Internet Archive's Wayback Machine by typing www.archive.org into their browser and looking out for the "Web" box near the header on the page. Next to this, there will be a white box where users can enter the domain name of the site they are looking for. As previously mentioned, this needs to be the full URL and not a keyword or phrase like you would use on a conventional web search like Yahoo! Search or Google. Although the Wayback Machine crawls internet content like these two sites, it presents information in a different way; there is no search engine results page or SERP that ranks content based on popularity or other factors. Once you've entered your domain name in the box, just click on the "Take Me Back" button to be presented with a graph of dates when the page was captured by the Wayback Machine's search bots. With so much data on their servers, this process can take a few minutes in some cases. If you are searching a relatively new domain, you might not find much content at all, or discover that content has been indexed but not yet archived. Older domains will enable you to see versions of a page that span the last ten to 20 years. Just click on one of the dates displayed on the screen and see a cached view of the page. If you are searching for a sub-domain, you will need to enter this full address on Archive.org in order to see that page. It might be disappointing to find that a page you are looking for hasn't been archived or includes expired images and graphics. You might want to check another version of the same page and see if the images are showing on Archive.org may have captured more information on a particular date, so it could be a case of trial and error until you find what you are looking for. Some features on a page might not work at all, such as maps or certain navigation menus. You also won't be able to input information in a page (such as a search on a website) and will usually be presented with an error message if you click on a submit button. Running Archive.org is a huge operation, with staff who work to ensure the archiving process is accurate and provides users with results based on the information they are looking for. The platform uses 400 parallel processors and 100 terabytes of disk space, as well as hundreds of gigs of RAM. It is the largest database ever built, according to its creator Brewster Kahle, even bigger than the system used by IRS and American Express. The service also receives 200 queries every second. The online Wayback Machine harvests information that is kept up to date on an hourly basis. Information is indexed on a set of machines and a load balancer then distributes queries to up to 20 machines that operate at the front end. Another 12 machines contain a stripped version of the index that enables the platform to provide information for people who are searching with a direct URL. The whole process only takes a few seconds. In an educational setting, users can search for old research reports and journals that might no longer be archived by Google. They can use this data for school and college reports and to convey obscure information that they can't find in their local library or on regular websites. Then the service is popular with researchers and marketers who want to check statistics and gain insights into old data sets in order to streamline workflows and create new marketing campaigns. Archiving so much information can be an expensive business. However, the site relies on donations from the public to keep it up and running. More than 20 million books are downloaded from the platform every single month and one billion pages are captured a week. To keep the Wayback Machine and Internet Archive offering these services, the platform asks people to donate $25, $50, or $75, or whatever they can afford to help pay for office premises, staff and servers. The Wayback Machine was launched in 1996 and over the last 20 years has transformed the way people access information. Although the process is relatively simple, the platform relies on several systems to ensure that information is accurate. Although users can't search for information like they would with a normal search engine, the Wayback Machine provides data that might no longer show on Google or Bing, with a wealth of historical treasures waiting to be explored. Users can find old news articles, blog posts and other content almost instantly and compare different pages to see how a website has evolved over the years. Changes in how the Internet Archive indexes information now provides users with more resources than ever before. As Archive.org continues to preserve web pages for future generations, users can take a glimpse at the past and discover how the internet used to be.